My fourth and final time of seeing Bill Posters Will Be Band*. This was their farewell gig. After 31 years performing they have decided to call it a day. Got in quick to get my tickets to see the end of an era - and be entertained. 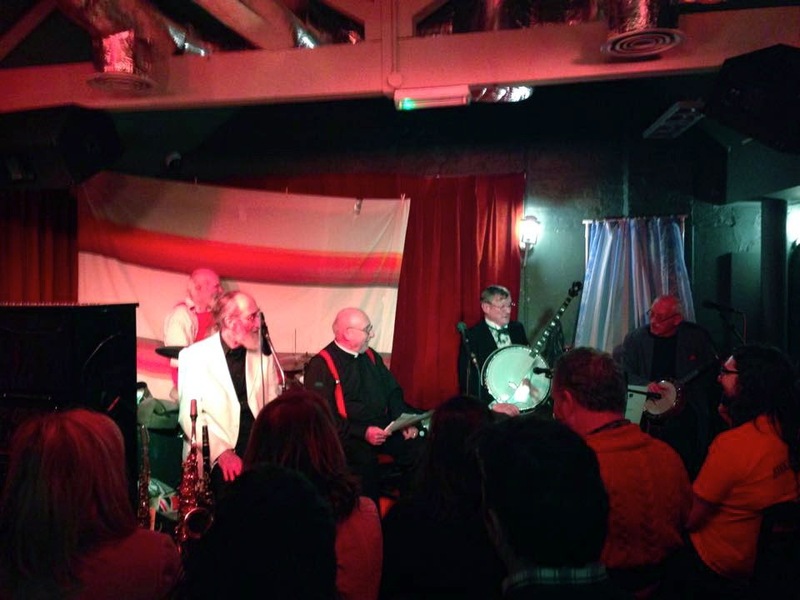 Featuring Peter Shade (off camera), Sam Spoons, Jim "Golden Boots" Chambers, Megs Etherington, John Gieves Watson and Vernon Dudley Bohay-Nowell (standing in for Biff Harrington). More biographical detail on the Bill Posters Will Be Band website. The act defies coherent description - musical lunacy with more than a flavour of Spike Milligan about it. They play a number of songs, wear silly costumes, do comedy skits, Peter wears a cat tea cosy on his head while Jim plays a coat hanger; later John plays a metal washboard tie. We get an old Bonzo's classic "Jollity Farm", sing-along to "Don't Tell I Tell 'E" (made famous by Adge Cutler and The Wurzels), comedy puppeteering from John, and too many other songs to remember. We unfortunately missed the final encore and valedictory speech as our taxi had arrived. All washed down with couple of pints of Doombar. Not a bad way to spend an evening. It is four years since we first saw the legendary John Mayall (Wedding anniversary weekend 2010) supported by Marcus Bonfanti. This time it was at Ronnie Scott's with Ronnie's regular support band the Nigel Price/Jim Mullen/Mick Hutton Trio. I got there early (6:15) in time to bag our favourite table - by the rail in the raised part of the premium seating directly in line with the centre of the stage. We have seen this same excellent support trio several times now. Like a number of other front men, Nigel Price always introduces the other band members but never introduces himself. Mary was in Switzerland and all flights to City airport were cancelled due to fog. She was rebooked on a Heathrow flight but it was touch and go if she would make it in time. As soon as she landed, through the miracle of modern telecommunications, I was able to order her food and drink timed for her arrival: she walked in the front door literally as John Mayall walked onto the stage. She dumped her bags and sat down before the welcome applause had died down. Phew! An excellent set - John Mayall seemed to be really enjoying himself. Afterwards we queued up to buy CD's, unusually separate CD's from each of the band members rather than the assembled company. So we bought three, one for each of Rocky Athas (lead guitar), Greg Rzab (bass guitar) and Jay Davenport (drums), and got them signed; we also got John to sign a couple of them as well. They have provided some excellent listening since.